I’ll be honest with you; I’ve never really seen the appeal with Loot Crate. I know it’s cool to feel like it’s your birthday every month but you usually end up with a lot of tat. Now what if you could get a box delivered to your door every month full of tasty gaming goodness? Well that’s exactly what Deck Maniacs is all about, and about feeding your card game addiction. So rather than just write about the experience I decided it was best to commit my hairy face and nasally voice to YouTube, sorry, there was no way I could review this kind of box without the medium of video. 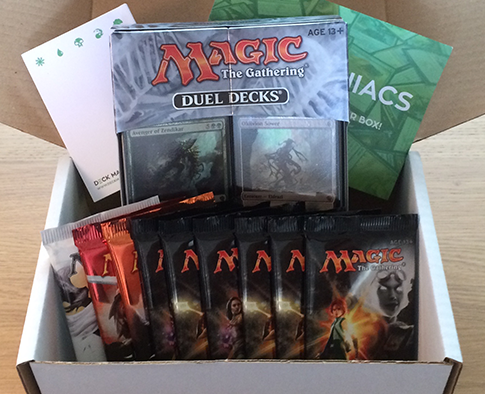 So here I am unboxing the package that came courtesy of Deck Maniacs. I can’t sing the praises of this box enough. There is superb value and if you’re into magic even remotely it’s a great way to get your card game fix. This review is based on a full retail copy of the box provided by the Deck Maniacs.